She never asked for the undying loyalty of a necromancer. Discover a fantasy romance set in 1913, a world of dark magic on the brink of war. 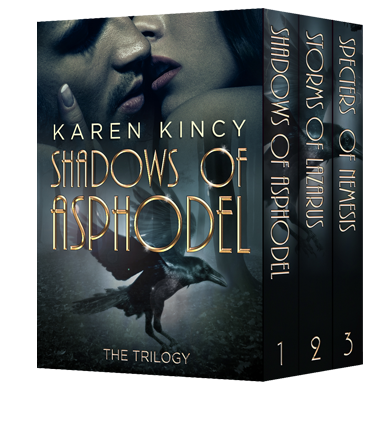 This box set includes Shadows of Asphodel, Storms of Lazarus, and Specters of Nemesis. Wendel wasn’t in the cabin. After checking the dining car, Ardis ventured reluctantly into the lounge car. Judging by the forest green carpet, leather chairs, and lingering scent of cigars, the lounge was meant to be a bastion of masculinity. But this early in the morning, there were no gentlemen to request that she leave at once. Discounting, of course, Wendel—though she wasn’t sure he was a gentleman. The necromancer sprawled in a chair, a glass of green-gold liquid in his hand. He sipped his drink, then smiled languidly at Ardis. She remained standing, and frowned. “What are you drinking?” she said. Wendel lifted the bottle to his face to inspect its contents. The color of the liquor within resembled his eyes remarkably. need any more. The absinthe scorched her throat, and she winced at the burn of alcohol. “Not bad,” she rasped, and she swallowed a cough. She glanced at his glass, and realized his drink was indeed paler than her own. “May I recommend a little sugar to cut the bitterness?” he said. Blushing, Ardis spotted a bowl of sugar cubes on the table, alongside a carafe of ice water and a slotted silver spoon. She remembered there was a ritual for drinking absinthe properly, though she didn’t know how. He shrugged and swirled the absinthe in his glass. “Perhaps the House of Hohenzollern?” she said. She drank more absinthe, and rolled its fire on her tongue. “Do you want to tell me more?” she said. A strange look passed over Wendel’s face like a shadow. He set down his glass too hard, and it wobbled before he steadied it with a finger. He mustered something resembling a smile, but she saw the darkness in his eyes. “What does Konstantin think he knows?” he said. “What kind of training?” she said, testing him. Wendel’s false smile vanished. He looked out of the window at the sunrise creeping between the clouds and the fog. “Do you have family in Vienna?” she said. She held out the bottle to him, but he ignored it. Ardis was distantly aware of her heartbeat thumping, and of a tightness in her throat. Wendel’s eyes glittered with a molten emotion she couldn’t name. She found it hard to look at him, but she didn’t dare look away. She still held the bottle of absinthe out to him, and when he took it from her, the very tips of his fingers touched hers. A shiver of electricity skittered down her backbone, as if she could feel the latent necromancy in his skin. For some strange reason, she wanted to touch him again. Ardis fought the urge, until Wendel looked away and she glimpsed a split second of his face. He was struggling to hide his fear, and this made him look more vulnerable than she had ever seen him before. Deliberately, her muscles tense, she sat in the chair opposite him and touched the back of his hand. “Trying to touch you,” she said. Karen Kincy (Duvall, Washington) can be found lurking in her writing cave, though sunshine will lure her outside. When not writing, she stays busy gardening, tinkering with aquariums, or running just one more mile. 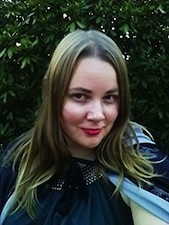 Karen has a BA in Linguistics and Literature from The Evergreen State College and an MS in Computational Linguistics from the University of Washington. She is a member of RWA.